← How to print PDF with attachment by PDFprint? For compressing and protecting PDF information, sometimes we may compress stream objects in PDF files. And when compress PDF in whole, we will find that those PDF file can not be compressed again. Meanwhile this kind of PDF file can not be edited any more. When editing PDF files in batch, those with compressed stream objects can not be handled successfully. In this article, I will show you how to uncompress PDF stream objects. I uncompress PDF under the help of software VeryPDF PDF Toolbox which can be used together with other applications like VB, VC, C# and others. There are three versions for you to choose: Mac, Linux and Windows. Here I will take the Window version for example. Please download PDF Toolbox first, once downloading finishes, there will be an zip file in downloading folder. Please extract it to some folder and then call pdftoolbox.exe from MS Dos Windows. And there are examples in test folder, help document in doc folder. When you run the procession, please refer to the examples and usage. When you need to uncompress PDF stream objects, please refer to the following command line templates. -pack : compress stream objects in a PDF file. -unpack : uncompress stream objects in a PDF file. Meanwhile by this software, you can also compress PDF stream object again. When you uncompress PDF then you can compress PDF file in batch from the whole. When you need to compress PDF, VeryPDF Compressor is really good in this aspect. This software is GUI version and there is also command line version available here. Download PDF Compressor. When downloading finishes, there will be an exe file, please install it by double clicking the exe. Once the installation finishes, there will be an icon on desktop. Please launch this software by clicking the icon. The following snapshot is from the software interface. By this software, you can compress PDF files as many as you need. Please click button Option then you will see the following snapshot. By this compressor, you can compress PDF file image and fonts two parts. When handling image and fonts, there are different methods, say when handling color image, grey image, and so on so forth. 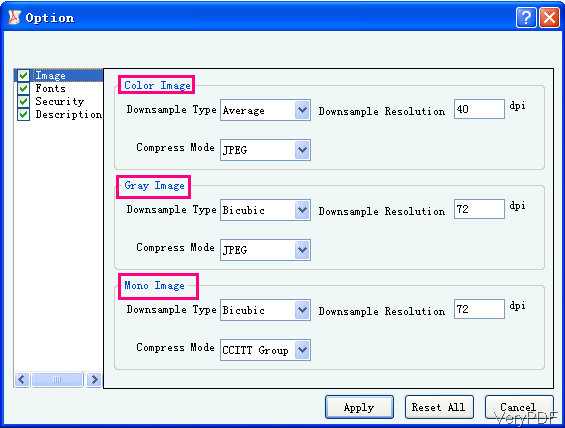 By those two software, you can compress PDF file with compressed stream objects easily. During the using, if you have any question, please contact us as soon as possible. This entry was posted in PDF Toolbox Command Line and tagged uncompress PDF. Bookmark the permalink.